The Little Gem magnolia tree is the sweetest of all South Florida's small flowering trees - compact, hardy, and wonderfully fragrant. The exquisite magnolia flower is said to produce nature's strongest perfume. Just one blossom can fill a house with its heady scent. 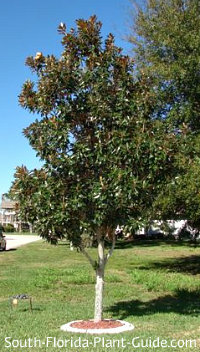 Small, shrubby and easy-care, this dwarf magnolia tree is equally at home in formal gardens or more casual landscaping. If you prefer a larger, more stately tree, consider the D. D. Blanchard magnolia. The Little Gem magnolia tree grows slowly to about 15 to 20 feet. It's a very cold-hardy tree and does well in all of South Florida (though it actually prefers cooler areas), and further north as well. 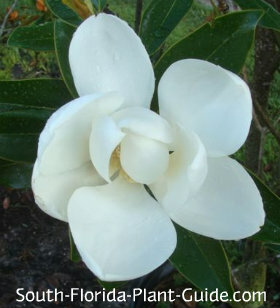 Magnolias are considered to be deer-resistant, though we make no promises. COMPANION PLANT SUGGESTIONS: Consider other cold-tolerant plants that will contrast well in color and/or texture: Plum loropetalum, variegated pittisporum, drift rose, foxtail fern, Indian hawthorne and pygmy date palm.